Thousands of Muslims living in the Greek capital use makeshift rooms to pray, awaiting the opening of the city’s first proper mosque, which is due to take place by the year’s end. Muslim men gathered in a basement transformed into a a prayer room in the neighborhood of Agios Nikolaos, in Athens, Greece. A small sign at the entrance of an underground garage in Athens reads, “Al Salam Mosque,” in English and Arabic. People, mostly men and children, are walking in and down the stairs. Two floors down, the lights are dim. It’s almost 3 on a Friday afternoon at this unofficial prayer room in the city’s Neos Kosmos neighborhood. Soon an imam starts to pray and everyone gathers around, forming three rows, one behind the other. A lone woman in attendance is sitting in a space separated with curtains. The whole service doesn’t last more than a half hour. It’s just another Friday, the holiest day of the week for Muslims who live in the Greek capital. This is just one of dozens of makeshift prayer spaces in the city: Athens is considered the last European capital without an official mosque. 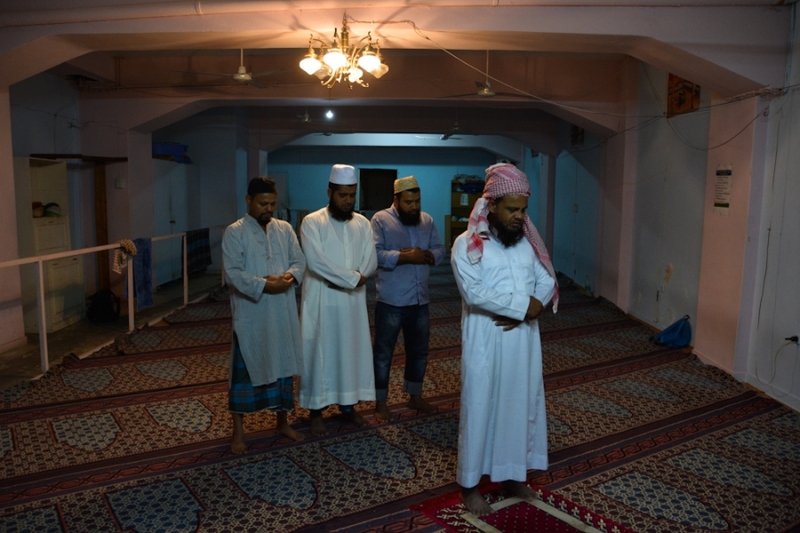 Men from Bangladesh pray on a Friday afternoon at the Hazrat e Umar prayer room in the neighborhood of Kato Patisia, Athens. More than 200,000 Muslims are estimated to live in Athens and the Attica region that surrounds it, according to Naim Elghandour, president of the Muslim Association of Greece. The total is hard to know for sure, he explains, since the Greek authorities don’t provide an official tally and estimates looking at immigration alone often don’t account for numerous children or converts to Islam.Yet, while some parts of Greece have mosques, Athens doesn’t. But that’s about to change. This ancient capital will finally have its first official, government-funded mosque in almost 200 years, since it was occupied by the Ottoman Empire. In the meantime, Athenian Muslims have gotten creative. Some have taken the initiative to rent empty apartments, garages or basements, and transform them into prayer rooms. An imam is preaching moments before the Jumu’ah (Friday prayer) begins at a makeshift mosque in Metaxourgio. Shoe cubbies are usually the first thing you see when entering one of Athens’ unofficial mosques. Elghandour estimates there are 100 unofficial mosques scattered in different neighborhoods around the city. Some are hard to find if you don’t have the exact address. “Greek authorities are aware of all the makeshift mosques. We are cooperating with them, we’re not hiding. Only three of them, however, have the license to operate as a worship place,” Elghandour says.The mosques are open to all Muslims who want to pray, regardless of nationality or denomination — most are run by Sunnis — but Elghandour says at the end of services everyone must contribute a little something for expenses, like rent and electricity. Greece has long been a gateway for travelers and migrants from the Middle East and North Africa. Its capital used to be a land of opportunities for immigrants coming from those regions, many of them Muslims, fleeing war or poverty. Mohammad, a 5-year-old boy from Syria, takes a nap before the night prayer on the floor of a makeshift mosque in the Attiki neighborhood in Athens. The Greek economic crisis that started at the end of 2009 changed things. Greece may be the European Union’s front edge of a historic migration — but this time many of the incomers say they’re aiming to reach other countries beyond this first stop on the continent, even though it doesn’t always work out that way. “After the Arab Spring, many Egyptians went back to Egypt, while lately a lot of Syrians and Palestinians left the country for northern Europe,” says Elghandour, himself an Egyptian.There are some Greeks who would prefer they did leave. Greece has experienced the rise of something seen in many Western countries: an Islamophobic, anti-immigrant, far-right movement. Here it’s called Golden Dawn. In July 2016, a Pew survey found well over half of Greeks polled had unfavorable views of Muslims in the country. A Muslim man is praying behind thick glass and heavy curtains at Al Taqua prayer space in the Metaxourgio neighborhood. Those attitudes are partly why it’s taken so long to put an official mosque in Athens. But Athenian Muslims are eager not just for acceptance, but equal recognition. “Back in 2006, as a president of the Muslim Association of Greece, I was one of the first to request for the Muslims of Athens to have an official mosque. We want it as a symbol. That Greece recognizes us as equal citizens of this country,” Elghandour says. A Greek national flag waves on the wall of an old naval base where the construction of the first formal mosque is underway, in Athens, Greece. This photograph was taken Feb. 6. Construction is expected to be completed by the end of summer. The nation’s parliament finally approved the mosque in August 2016, and a consortium of Greece’s biggest construction firms took up the project, at a former military base in the Votanikos neighborhood. The project is being funded by the Greek state and will cost almost 887 million euros, or about $950 million.Construction started last November and was expected to be complete this month, but there have been delays. Elghandour says the mosque should be ready for use by August. Al-Jabbar mosque in the center of Athens can only be identified as a Muslim place of worship by a short phrase written in Arabic over the entrance door.